Here is the last of my A-England The Legend collection order. You can see Ascalon and Saint George the other two as well. 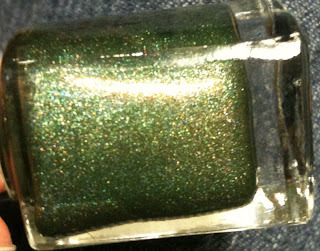 This is Dragon, a fantastic medium grass green with gold holographic and a very slight copper/gold duochrome. 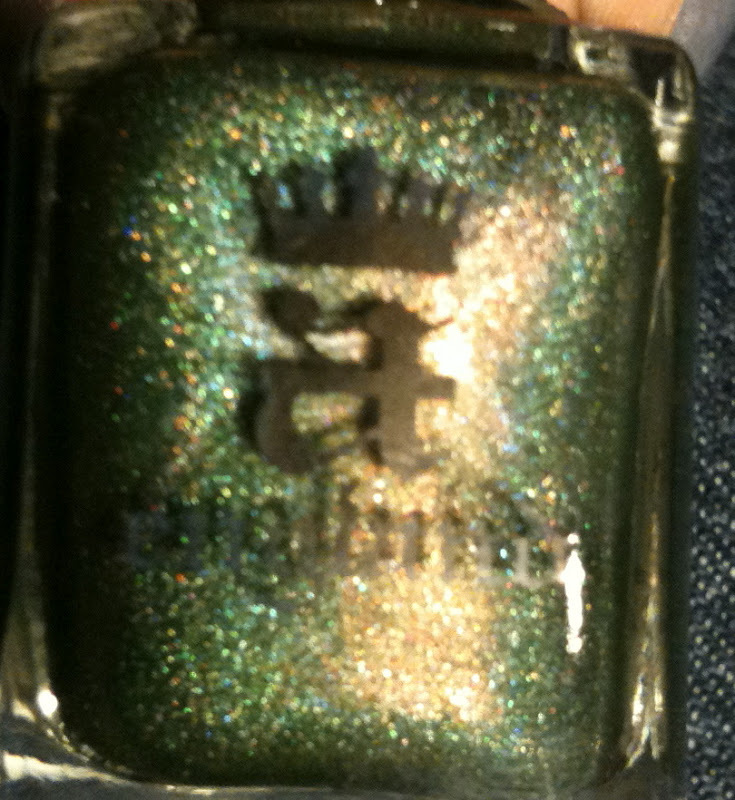 It very much is a dragon colour, the gold in it reminiscent of sunlight and fire. Most of time for this shade the gold doesn't show up which is sad and it is actually very close to Nubar Reclaim if that is a colour you already own. Dragon is about a half-shade darker than Reclaim though Reclaim lacks the very slight copper sheen that Dragon sometimes shows. If you have one I don't think you need the other, though both are lovely. 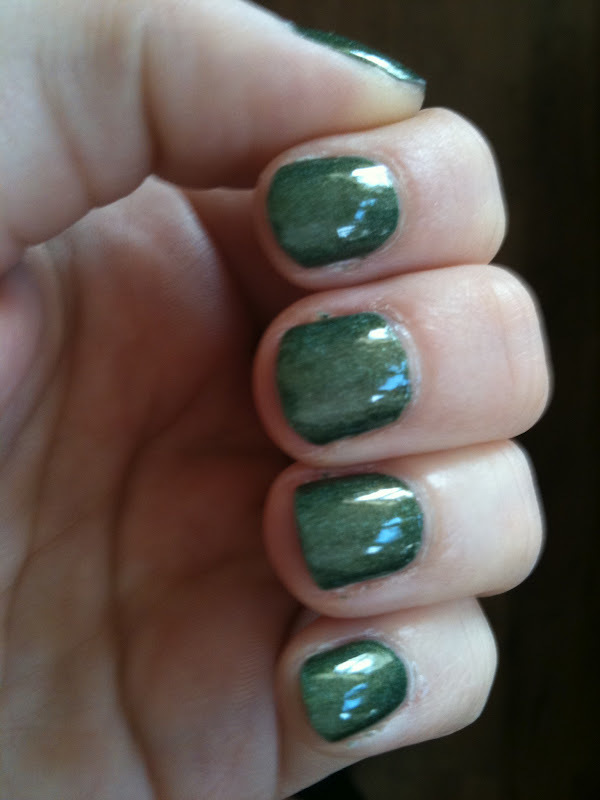 I found this one pretty good to work with and like Ascalon needed 2-3 coats to cover. I did have some early tip wear but other than that it seems to be lasting fairly well on. 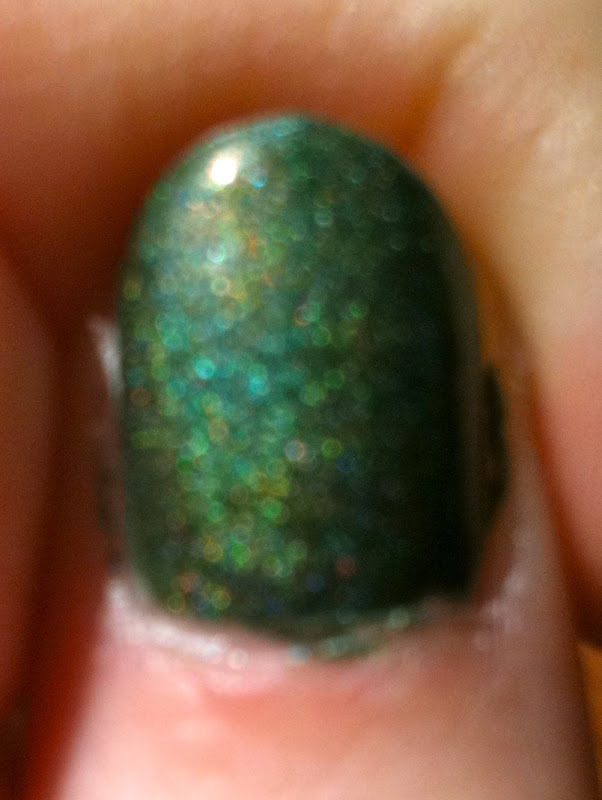 The holo part of this polish doesn't really show up unless in direct sunlight and it was super difficult to capture the copper flash in this (though I think the picture above does a pretty good job). 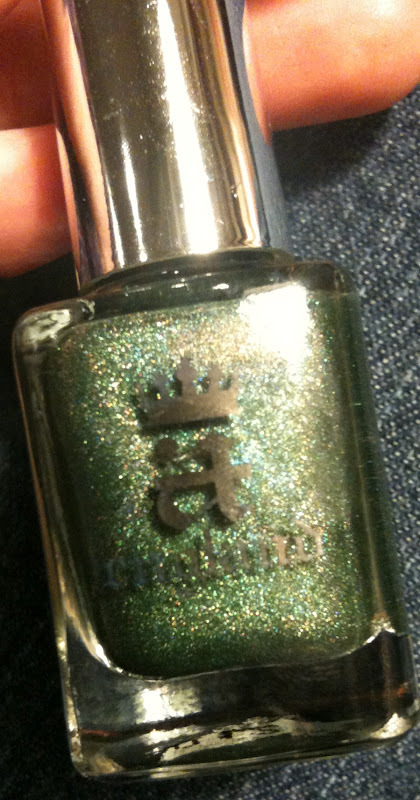 I was kind of hoping for a bit more as the bottle shows the effect much better than the nail. Overall, Dragon is a lovely shade that really suits the theme of this collection. 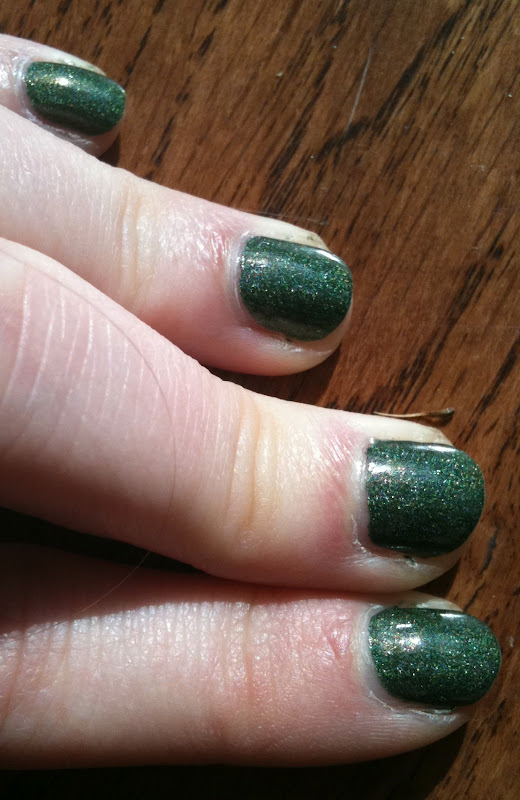 It was slightly difficult to work with in that it was a little thick and it chipped sooner than the other two shades I tried. 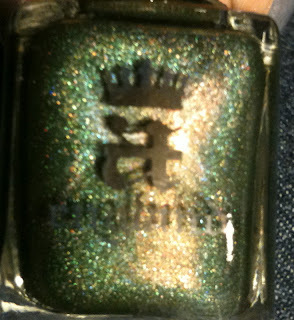 I was also hoping for a bit more duochrome and holographicness but it does have an awesome combination of colours. 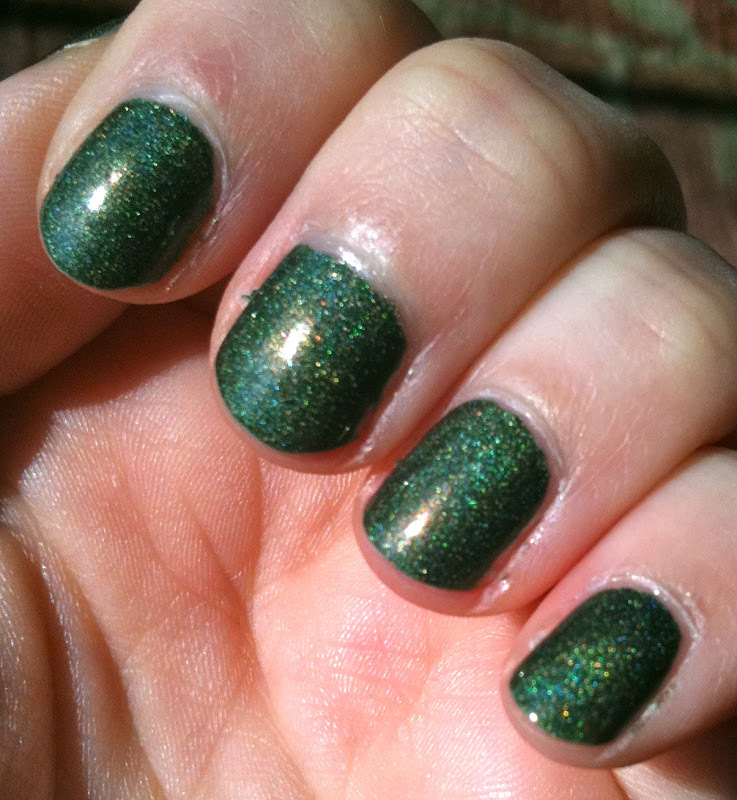 Sprite Rating: 8/10, I was hoping for just a little more out of this polish in most ways so I had to lower the score a bit. Would I buy this again? Yes, I would but I'd have to get through my bottles of this and Nubar reclaim first! That's a great green! You did a good job capturing the holo in the pics. Too bad it isn't more prominent.